This new Handbook provides a series of reference guides to cleaner production methods, technologies, and practices for key industry sectors. 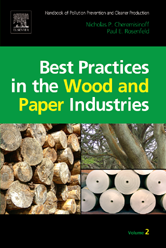 Each volume covers, for each industry sector: the manufacturing technologies, waste management, pollution, methods for estimating and reporting emissions, treatment and control technologies, worker and community health risk exposures, cost data for pollution management, cleaner production and prevention alternatives Best Practices in the Wood and Paper Industries provides an overview of the forestry, wood preserving, pulp and paper industries and identifies the key environmental aspects, supported by case studies of major incidents. It provides general explanations of the major unit operations and processes in pulp and paper mills and wood treating plants, covering new trends alongside traditional methods. The environmental issues regarding air, water and solid waste are all addressed, identifying all US plants and their TRI data, and the authors provide calculation methods for properly accounting for air emissions and P2 practices to reduce them.